Cold temperatures, salt, sand and icy conditions play havoc with keeping a sweeper going strong. For those in the northern states, winter is a time when special care has to be taken to keep sweepers in top running condition. Cold temperatures, salt, sand and generally icy conditions can play havoc with keeping a sweeper going strong throughout the winter season. In the winter months, our organization inevitably fields more calls from customers who need to replace the electric solenoids that control the valves on their sweepers' hydraulic systems. When sweepers are out cleaning up the salt/sand mixture that's been put on the roads for traction purposes, the salt gets in between the solenoid's cartridge and magnetic coil. In those instances, once a week, the coils need to be taken off the screw-in valves that they slide on. Next, brush the salt off all the interior surfaces. Then, apply a good lubricating grease onto the valve prior to sliding the coil back on. This will minimize the ability of the salt to reenter. If you don't lubricate them, those coils can burn up as frequently as once a month, and it's an absolutely needless expense. If you have any questions about this process, contact your sweeper manufacturer, or the manufacturer of the electric solenoid. 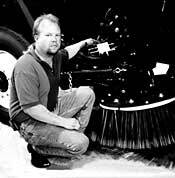 Another possible wintertime maintenance task may include changing to thinner flaps on your air sweeper's pickup head. In extreme cold, you may find that the sweeper tends to 'bulldoze' debris in front of it, instead of drawing the material in under the head where it can be picked up. That's because the rubber of the flaps becomes less flexible in cold weather. When that occurs, you need to switch to a thinner flap(s) on the front of the head. The rear flaps can be left the same, since they're designed to keep the debris from trailing out the back of the head before it can get propelled into the hopper. If your air sweeper is trailing, and you think it may be caused by the flaps being too heavy but aren't really sure, my recommendation is that you call your manufacturer's parts department and discuss the situation with them. Chances are, they can provide you with the information you need. A sweeper's water system is another frequent victim of cold weather. If you don't have a heated building where you store your sweepers when they're not in use, you have to make sure your water system is completely drained and all your lines are empty. With most sweepers, the best way to do this is to remove the water filter. Typically, it's located at the very bottom of the water tank, before it feeds to the pump. The best method to get all the water from the lines varies according to sweeper model, so refer to your sweeper's owners manual for specific instructions. Remember that it's equally important to drain the tank, the lines and the nozzles of the sweeper's water system. That's the only way to ensure you don't damage your system by allowing ice to freeze inside it. When temperatures get down toward zero, you'll find that your gutter brooms will move significantly slower during the first few hours of operation. You can solve that problem by dropping the weight of the fluid by 10, i.e., go to a 20-weight hydraulic fluid. Be sure to change back when temperatures go up. If you follow the above procedures, chances are that your sweeper will get through the coldest winter without sustaining any damage other than normal wear items. Bill Manning may be reached by calling the Schwarze factory at 1-800-879-7933. You may also reach him through e-mail sent to bmanning@schwarze.com.